From a bookseller’s viewpoint, “military books” are usually lumped together as a subset of the history section. But this popular genre has many sub-categories. Among military buffs are those who read biographies of the great leaders; others whose interest is the minutiae of a particular war or even a specific battle; some with an abiding interest in the theory and principles of warfare; a significant number for whom the weapons and equipment of warfare (or of a particular war) holds a fascination; espionage buffs; and a few whose reading tends toward the underlying political and diplomatic issues. Some may disagree, but I’d put Catch-22, Gardens of Stone, and most of Tim O’Brien’s novels into the anti-war category. 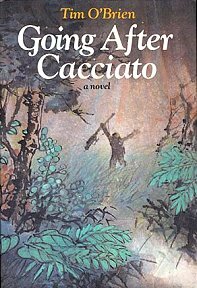 Going After Cacciato, O’Brien’s first novel, demonstrates the mental dissolution felt by many Vietnam combatants, just as Catch-22 chronicles the breakdown of its principal character, Yossarian. 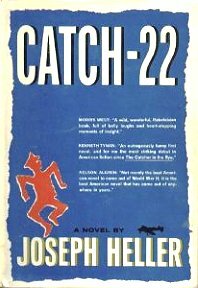 But Cacciato lacks Joseph Heller’s black humor. O’Brien’s characters—in this and his other novels—are mad as hatters, but dead serious. I find Nicholas Proffitt’s Gardens of Stone (1983) intriguing for several reasons. First, because it treats a subject of which I have first-hand knowledge—the activities of a stateside burial squad during the Vietnam War. Second, because it contains one of the most wonderfully foul expressions of male sexual desire outside the works of Henry Miller and his cohorts. In a brief passage one, career soldier describes his fascination with a particular woman thus: “I’d drag my balls over ten miles of broken glass to listen to her pee into a tin cup.” Soldiers, particularly the career types, can be appallingly crude, and as shocking as this passage may sound, it pales in comparison to the level and constancy of verbal crudity that the average soldier experiences. In Erich Kuby’s 1962 novel, The Sitzkrieg of Private Stefan, the title character is a bookseller, drafted into the German army in the second World War. Stefan’s obstinate refusal to be assimilated into what Kuby calls the “gray, corporate world of military existence” provides amusement, but ends in tragedy. Stanislaw Lem, best known for his science-fiction writing, produced The Hospital of the Transfiguration, in which a young Polish physician finds himself escaping the war by serving in a rural mental institution. Like so many such places (at least in fiction), events lead the reader to wonder whether the inmates are crazier than those running the place. In The Paths of Glory (1935), Humphrey Cobb writes of three soldiers executed for charges trumped up to save face for a superior officer. 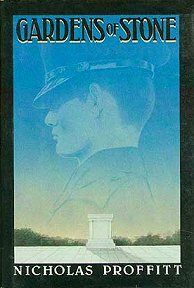 The novel does not preach against war so much as it depicts the corruption inherent in such strict hierarchies as the military (in this case, the French army). Kenneth Reed, writing in 1974, produced Mennonite Soldier, an intriguing tale of two brothers who part politically in the most dramatic possible way during the First World War. One goes to prison as a conscientious objector, even as his brother enlists as an infantryman. Though he inadvertently becomes a war hero, the second brother finds himself shunned by his family as a result. As the dustjacket blurb indicates, this war was a watershed event in the lives of most American Anabaptists. He threw back his head and started to yell from fright. But he only started because he had no mouth to yell with. He was so surprised at not yelling when he tried that he began to work his jaws like a man who has found something interesting and wants to test it. He was so sure the idea of no mouth was a dream that he could investigate it calmly. He tried to work his jaws and he had no jaws. He tried to run his tongue around the inside of his teeth and over the roof of his mouth as if he were chasing a raspberry seed. But he didn’t have any tongue and he hadn’t any teeth. There was no roof to his mouth and there was no mouth. He tried to swallow but he couldn’t because he had no palate and there weren’t any muscles left to swallow with. He began to smother and pant. It was as if someone had pushed a mattress over his face and was holding it there. He was breathing hard and fast now but he wasn’t really breathing because there wasn’t any air passing through his nose. He didn’t have a nose. He could feel his chest rise and fall and quiver but not a breath of air was passing through the place where his nose used to be. He got a wild panicky eagerness to die to kill himself. He tried to calm his breathing to stop breathing entirely so he would suffocate. He could feel the muscles at the bottom of his throat close tight against the air but the breathing in his chest kept right on. There wasn’t any air in his throat to be stopped. His lungs were sucking it in somewhere below his throat. It was like staring into complete darkness with your eyes popping out of your head. It was a process of feeling with his skin of exploring with something that couldn’t move where his mind told it to. The nerves and muscles of his face were crawling like snakes toward his forehead. It was funny how calm he was. Trumbo, along with other members of the so-called Hollywood Ten, was called before the House Committee on Un-American Activities in October 1947 as an “unfriendly” witness during its investigation of Communist influence in Hollywood. The others–producers, writers, and directors–included Ring Lardner, Jr. All refused to say whether or not they were Communists, all served prison sentences for contempt, and were blacklisted in the film industry. Numbers have dehumanized us. Over breakfast coffee we read of 40,000 American dead in Vietnam. Instead of vomiting, we reach for the toast. Our morning rush through crowded streets is not to cry murder but to hit that trough before somebody else gobbles our share. *** Let us use this same arithmetic for World War I; 9,000,000 dead young men equal 1,350,000,000 pounds of bone and flesh, 27,900,000 pounds of brain matter, 11,250,000 gallons of blood, 414,000,000 years of life that will never be lived, and 22,500,000 children who will never be born. The dry if imposing figure “9,000,000 dead” seems a little less statistical when we view it from this perspective. Trumbo was primarily a screenwriter. His credits include Kitty Foyle, a controversial Christopher Morley novel of the late 1930s, which included an out-of-wedlock pregnancy and abortion. Others are A Bill of Divorcement; Spartacus; Exodus; the movie adaptation of Bernard Malamud’s The Fixer; Roman Holiday; and finally, a television adaptation of Theodora Kroeber’s documentary Ishi in Two Worlds. Roman Holiday earned Trumbo a posthumous Oscar, forty years after its release, and in 1975 he had received an Oscar for The Brave One, another work from the era when he was officially blacklisted in Hollywood, and forced to work under a variety of pseudonyms. (Rather than make up names out of whole cloth, Trumbo managed to convince a few of his non-blacklisted colleagues to lend their own names to his screenplays. Thus the original Oscar for Roman Holiday was awarded to Ian McLellan Hunter.) So, while many anti-war novelists have been one-book wonders, or have written mere variations on the same story, Trumbo wrote copiously, and from any number of political viewpoints. Whether or not you would consider his costume epics to be pro-military films, his anti-war politics did not appear to have colored Thirty Seconds Over Tokyo and The Court-Martial of Billy Mitchell. Alas, there is no comprehensive biography of Dalton Trumbo, so we’re left to our own conclusions about his personal politics. At least unofficially, he admitted to membership in the Communist Party of the U.S.A., years after his grilling in the HUAC hearings. 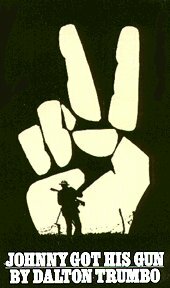 Curiously, little if any anti-war fiction has dealt with post-Vietnam warfare, despite the fact that U.S. citizens have been bitterly divided on the justification for the Persian Gulf wars, the war in the Falklands, the ongoing Arab-Israeli and Irish-British conflicts, to name only the most obvious examples. I cannot but wonder whether this stems from lack of artistic inspiration, or fear of reprisals. Put the guns into our hands and we will use them. Give us the slogans and we will turn them into realities. Sing the battle hymns and we will take them up where you left off. Not one not ten not ten thousand not a million not ten millions not a hundred millions but a billion two billions of us all the people of the world we will have the slogans and we will have the hymns and we will have the guns and we will use them and we will live. Make no mistake of it we will live. We will be alive and we will walk and talk and eat and sing and laugh and feel and love and bear our children in tranquility in security in decency in peace. You plan the wars you masters of men plan the wars and point the way and we will point the gun.